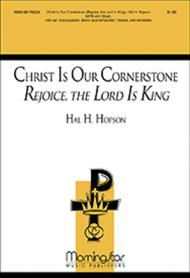 Christ Is Our Cornerstone: Rejoice, the Lord Is King (Choral Score) composed by Hal H. Hopson. For SATB choir, optional congregation, organ, brass quartet or brass quintet, timpani, handbells. Medium. Choral Score. Published by MorningStar Music Publishers (MN.60-7002A).This concertato or hymn-anthem on DARWALL'S 148TH has multiple uses throughout the church year. The double text allows for flexibility in usage. Appropriate for All Saints, the fifty days of Easter, and Pentecost. Optional instrumental parts are available for Brass, Timpani, and Handbells. A flexible number of handbells may be used ranging from seven bells to 41 bells. Organist may play from either the Full Score or the Choral Score. Choral Score includes reproducible congregational page.